Where friends don't blog about other friends' butts. B.J. Novak at Ackerman Grand Ballroom, UCLA, 8pm. Ed Helms on ‘The Tonight Show with Jay Leno,’ NBC. Did you know you can track whenever a MySpacer makes a change to their page? 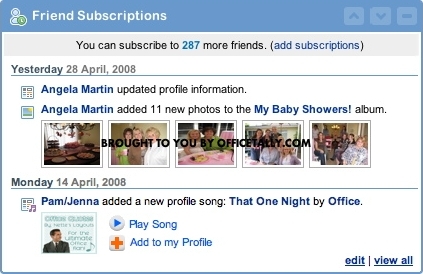 Just create a MySpace page, add the person you want to follow to your friends list, and then subscribe to them from the Friend Subscriptions module on your home page. Article: Steve Carell on How to Act Brilliant. Article: John Krasinski shoots his next film — Big names in town as unnamed movie holds shoot on Mountain Road | Second photo. Article: B.J. Novak at the White House Correspondents’ Association Dinner in DC. Article: Marx & Michael Scott. Article: Comedian Oscar Nuñez has 9-to-5 fun at ‘The Office’. Article: Jenna Fischer appears on FHM’s 100 Sexiest Women list. Photos: a member of ‘The Office’ production staff very generously shares behind the scenes photos from Safety Training, Beach Games, Survivor Man, and Dunder Mifflin Infinity. If more photos come my way, I will be sure to post them here at OfficeTally! Giveaway: watch tomorrow’s edition of CNBC’s “Conversations with Michael Eisner” to bid on a signed Dwight Bobble Head! Newsletter: a new Dunder Mifflin Scranton newsletter has been posted. Archive: I’ve created a new OfficeTally archive called Office Writers, which includes the writer Q&As, chats, and interviews. Lots of funny stuff in there! Live appearance: Mindy Kaling appears in Comedy Death-Ray at the UCB Theatre on Tuesday, April 29th. Live appearance: B.J. Novak appears at UCLA on Wednesday, April 30th. Live appearance: Kate Flannery appears in The Lampshades at iOWest on Saturday, May 3rd. TV appearance: rumor has it that The Office’s co-executive producer Michael Schur (aka ‘Mose’) will appear on the premiere show of HBO’s Costas Now on Tuesday, April 29th. TV appearance: Ed Helms appears on ‘The Tonight Show with Jay Leno’ on Wednesday, April 30th. For a complete listing of events, subscribe to the OfficeTally Calendar. I am just so happy that Mindy Kaling agreed to answer Tallyhead questions about last week’s episode, Night Out. Thank you, Mindy! This is one of the funniest Q&As so far. Enjoy, guys! SPOILER WARNING! Content and comments posted here may contain spoilers. It was dark, but I don’t mind dark. “Money” was dark, and it is my favorite episode of Season 4. This was just a little strange. “Night Out” begins with Ryan making a visit to the office to, once again, try and get the employees of Dunder Mifflin, Scranton, to embrace the website. The only people who have embraced it so far are not allowed to live near schools or playgrounds — or are named Creed.